Photograph, sepia, Hawkshead Courthouse, Hawkshead, Lancashire, by Herbert Bell, photographer, Ambleside, Westmorland, 1890s. Purpose uncertain, probably courthouse, now farm building with 1st floor exhibition hall. Possibly C13 but probably C15, with later alterations and restorations, 1849 and 1932. Stone rubble with ashlar dressings, slate roof. 2 storeys, 3 bays. East facade has central passageway with segmental-pointed arch with part of right jamb. Keystone a replica of original now attached to Hawkshead Old Hall (q.v.). One stone to left inscribed: "J. THOMPSON/BOLTON 1849". Rough voussoirs above ashlar. Ventilation slot to left. 1st floor has niche over lion-head corbel, with canopy, crocketed pinnacles and cusped arch with fleuron. Straight-headed windows of 2 cusped pointed lights, that to left renewed, that to right has original tracery head. South gable-end has crow-stepped gable. 2 ventilation slots, the'inner chamfers angled possibly for defence; 1st floor 2-light traceried window with 4-centred head. 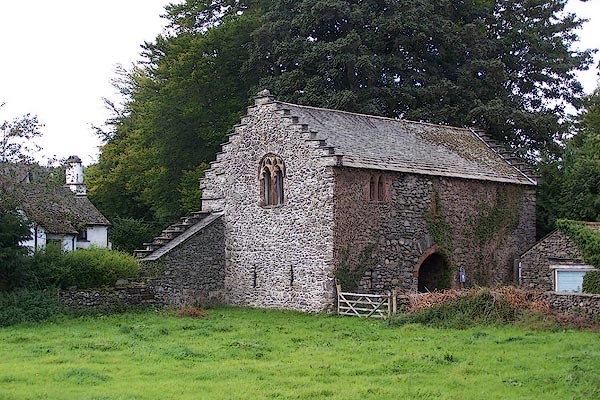 To left is small lean-to projecting wall, part slate, part crow-stepped, which forms part of a south wing, connecting courthouse with Hawkshead Old Hall (q.v. ), now demolished. North gable-end has crow-stepped gable. Blocked ground floor entrance with segmental head has straight joint to right and is now partly obscured by stair to 1st floor entrance. West facade has wide flat buttress to right hand end. Passageway has segmental arch, with rough voussoirs; entrance to left with ashlar dressings, segmental-headed entrance to right. 2-light mullioned window to left hand end, with blocked entrance above. 2-light window with cusped pointed heads above passageway has inscribed panel recording 1932 restoration. To right is part of former south wing which has fireplace with bressummer. Interior has collar and tie beam trusses and C13 fireplace with 3-centred arch and dog tooth moulding, part of jamb missing. Originally part of monastic grange associated with Furness Abbey. Property of the National Trust. Print, engraving, Hawkshead Hall, and Hawkshead Courthouse, Lancashire, published by John Johnstone, Paternoster Row, London, et al, 1847. On p.93 of Sylvan's Pictorial Guide to the English Lakes. Print, uncoloured engraving, The Old Hall, Hawkshead, Lancashire, engraved by W J Welch, published 1870. On p.83 of Furness, Past and Present. hearsay Built by monks of Furness Abbey and used for their wool business. It was a court, and a gallows stood on a hill nearby. A niche over the entrance held a statue of the Blessed Virgin Mary. In the 16th to 18th centuries it was the home of the Nicholson Family and Copely Family.